The sky at 10:30 p.m. local time from mid-northern latitudes on May 26. If one were to do an informal survey of the constellations, you might get the distinct impression that the night sky was truly for the birds. There is a swan, an eagle, a dove, a crane, a toucan, a peacock, a bird of paradise and even a mythical phoenix. And over toward the south as night falls these late spring evenings is yet another: Corvus, the Crow. Next to the famous Sickle of Leo, Corvus is probably the most striking star pattern in the spring southern sky for those living at mid-northern latitudes. It appears as a small, moderately bright quadrilateral-shaped pattern of stars; like a triangle whose top has been removed by a slanting cut. Add a fainter adjoining star and the pattern resembles the battened mainsail of a Chinese junk. Corvus can also be used to positively identify the bluish first-magnitude star Spica, in Virgo. Just follow the direction of Corvus' slanting top to the east (to the left) and you will soon arrive at Spica [Map]. Corvus is supposed to represent the unfaithful raven of the god Apollo. The bird was sent out with a cup for some water, but instead loitered at a fig tree until the fruit became ripe. He then returned to Apollo without the cup, but with a water snake in his claws, alleging the snake to be the cause of his delay. As punishment, the angry Apollo changed Corvus from silvery-white to the black color that all crows and ravens bear to this very day. In addition, Corvus was forever fixed in the sky along with the Cup (Crater) and the Snake (Hydra), doomed to everlasting thirst by the guardianship of the Hydra over the Cup and its contents. Crater, the Cup is a small and rather faint figure, which corresponds quite closely to its name. Its stars rather nicely outline a goblet, but unfortunately they're hard to distinguish when the sky is hazy or when there's a bright Moon in the sky. A couple of weeks ago, we highlighted Crux, the famous Southern Cross. Interestingly, when the four-sided Corvus has reached its highest point in its course across the sky, it stands directly above the Southern Cross, which is also attaining its highest point above the South Pole of the sky. But as we noted last week, even at its highest, the Cross remains out of sight below the horizon everywhere in the United States except for the Florida Keys. Thus Corvus reveals the position of a constellation whose name is known to almost everyone though invisible to many of us. 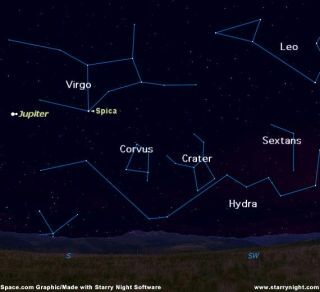 Lastly, we should mention one other star pattern, which can be found on some older star atlases sitting complacently on the end of Hydra's tail. It is Noctua, the Owl. Composed of nearly two dozen mostly faint stars, this night bird was created in 1776 by a Frenchman, Lemonier, in memory of the voyage to Rodriguez Isle of the famed French astronomer, Alexandre Guy Pingre. Unfortunately for Lemonier and Pingre, the Owl is no longer recognized as an official constellation; its dim retinue of stars belonging now to Virgo and Libra. This is sadly ironic in a way, since we already pointed out that there are a variety of different birds that inhabit the nighttime sky. Yet the bird that is most associated with the night is not one of them!